CueCard is a simple and intuitive flash card program. Just make up cards for what you want to memorize, and CueCard will quiz you on them. 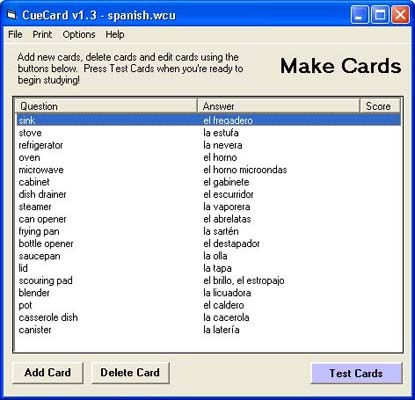 CueCard automatically focuses on the cards you are having trouble with.CueCard also offers printing, pictures and sounds on cards, Unicode support, a multi-lingual user interface, Import/Export and a variety of study modes.Important note: Version 1.51 no longer supports computers running Windows 95. Important note: Version 1.51 no longer supports computers running Windows 95. If you want a version which supports Windows 95, you must download version 1.46. * Unicode support (for example Japanese and Chinese characters can now be displayed natively). * Printing has been overhauled. You can now control the layout of the cards on the page, use custom paper sizes, and preview your printouts. * Sounds can now be added to cards. * The Edit panel has been improved. You can now preview the final appearance of the card from there. * There is a now a timer that can be enabled while studying. * Quiz mode lets you save the results of your quiz to a file. Qweas is providing links to CueCard 1.51 as a courtesy, and makes no representations regarding CueCard or any other applications or any information related thereto. Any questions, complaints or claims regarding this application CueCard 1.51 must be directed to the appropriate software vendor. You may click the publisher link of CueCard on the top of this page to get more details about the vendor.